For decades, there has been a virtual giveaway of offshore drilling rights. And the Trump Administration is planning to put much more on the auction block. When the government awards energy companies the rights to drill for offshore oil and gas, it’s supposed to make sure the American public, which owns the resources, doesn’t get screwed. However, decades of data suggest that the government has been falling down on the job, a Project On Government Oversight analysis found. The average price paid per acre in each Gulf of Mexico auction has declined by 95.7 percent, from $9,068 to $391, POGO found. The system the government has been using to auction drilling rights since 1983 has enabled energy companies to secure offshore leases for a pittance. On an inflation-adjusted basis, comparing the era before the change to the era since, the average price paid per acre in each Gulf of Mexico auction has declined by 95.7 percent, from $9,068 to $391, POGO found. Over the decades, that has added up to a decline in auction payments of tens of billions of dollars. With the Trump Administration planning to open immense stretches of ocean floor to oil and gas companies, the stakes are rising. If the past is any indication, more publicly owned resources could be turned over to industry at bargain-basement prices. Far from fostering real competition for drilling rights, the system in place since the Reagan Administration has delivered little more than an illusion of competition. In this Alice-in-Wonderland version of an auction house, the low bid generally wins, because the low bid and the high bid are typically one and the same—the only bid. For example, in the most recent auction, companies placed bids on 90 tracts. Of those tracts, 81 drew only a single bid. The vast majority of winning bids were unopposed. Over the past 20 years, more than three-quarters of the leases awarded in the Gulf of Mexico—76.6 percent—were awarded on the basis of single bids, POGO found. Those general problems have been documented by experts in the past, but, if they ever achieved any widespread recognition, seem to have been all but lost in the current debate over offshore drilling. POGO’s analysis shows that the patterns have continued to the present. More importantly, POGO’s analysis shows why the near absence of head-to-head bidding could be a much bigger problem than the government has acknowledged. The government says that, before it accepts any bid, it studies the tract of ocean floor to make sure the bid delivers fair market value. The government’s “bid adequacy” assessments supposedly protect the taxpayers if the market does not. But, in light of POGO’s findings, it is unclear why the public should take any comfort in the government’s bid adequacy determinations. Under published procedures, the Interior Department can automatically accept the high bid for certain tracts if it considers the tracts “non-viable,” which the Department defines as lacking “the potential capability of being explored, developed and produced profitably.” If the Interior Department considers the tracts non-viable, it need not perform a full valuation, according to federal disclosures. In 79.5 percent of the more than 13,000 bid adequacy determinations that POGO examined, the Department categorized the tract as non-viable and accepted the “high bid” on that basis, according to government disclosures. Over the past 20 years, companies placed high bids totaling $7.8 billion on Gulf of Mexico tracts the Interior Department categorized as non-viable, POGO found. Evidently, energy companies saw value that the government did not. In many cases, companies doubled down on the investments they made in supposedly non-viable tracts—and then doubled down again. First, they drilled costly exploratory wells on those tracts. Then, they shifted into production mode to extract oil or gas, POGO found. Most of the leases that ultimately became energy-producing—68.7 percent—involved tracts the Interior Department had classified as non-viable, according to POGO’s analysis. For the Interior Department, disposing of tracts as non-viable—that is to say, worthless—can be the easy way out. It can involve less work and less risk than declaring the tracts viable and coming up with valuations that energy companies could force the Department to defend. On average, for tracts the Interior Department considered viable, the high bids that companies placed were over six and a half times that measure of market value, POGO found. For example, in the most recent auction, for one of the few tracts that drew competing bids, the high bid was $5.7 million. That was almost six times the government valuation of $980,000, according to a government document. POGO’s examination of Interior’s bid adequacy determinations is based on data available online detailing the government’s treatment of 13,212 high bids that companies submitted for Gulf of Mexico tracts since 1997. One way to look at this picture: The government consistently got more money than it thought the tracts were worth. Another way of looking at it: The government consistently underestimated the market. Either way, the numbers beg the question: How much more could the government have gotten if it set higher expectations or ran more competitive auctions? Further research by POGO supports the theory that more head-to-head bidding could yield higher bids. When there was only one bid on a tract—by far the most common scenario—that bid was, on average, more than double the ADV. When there were two bids on the same tract, the high bid was, on average, more than triple the ADV. When there were three bids, the high bid was, on average, almost quadruple the ADV. And, when there were four bids, the high bid was, on average, more than quintuple the ADV. Beyond that range, the number of bids trailed off and the consistency of the pattern faded. It is of course possible that the tracts drawing multiple bids were more valuable to begin with. Interior’s Bureau of Ocean Energy Management (BOEM), which manages offshore drilling rights, acknowledges that some bidders have gotten bargains. “[I]n some cases BOEM issued leases where it estimated the block values to be negative, the blocks were issued for near minimum bid, and the lessees made discoveries of substantial size,” Bureau planning documents say. Energy companies saw value that the government did not. The most recent auction, held in August 2017, showed how different companies can attach different values to drilling rights and illustrated the potential value of competition. In one of those rare cases in which companies went head to head for the same tract, one bid $3.5 million and the other bid more than triple that amount—$12.1 million. A 2008 auction for drilling rights in Alaska’s Chukchi Sea made the point even more vividly. For a tract called block 6763, the lowest of several bids was just over $100,000. The highest was more than $100 million. The unusually robust competition came amid a spike in oil prices. The data POGO analyzed suggest that, to divine or demand market value, there may be no substitute for a truly competitive market. The problems are particularly worthy of attention now. Last month, the Trump Administration unveiled the first draft of a new five-year plan for issuing offshore leases, and, as part of that effort, it proposed opening almost all of the U.S. outer continental shelf to drilling. That includes previously off-limits parts of the Arctic, Atlantic, and Pacific, as well as Florida’s Gulf Coast. Expanding drilling while using the same uncompetitive leasing system could perpetuate the problems on a larger scale. The latest auction of drilling rights illustrated the system’s flaws. The Trump Administration has been spinning it as a success and has tried to take credit for it. A March 2017 news release from the Interior Department heralded the offering. “Secretary Zinke Announces Proposed 73-million Acre Oil and Natural Gas Lease Sale for Gulf of Mexico,” the headline on the release said. The August 16 auction “would include all available unleased areas in federal waters of the Gulf of Mexico,” the announcement said. Under a system since 1983, known as "area-wide leasing," all available tracts of ocean floor in vast swaths of the Continental Shelf are placed up for bid by the government. The Interior Department holds an auction for offshore drilling rights. Companies submit bids, which must meet government-set minimums (e.g., $100 per acre.) Unlike a typical auction, the offshore auction includes no back-and-forth bidding. If the tract is deemed incapable of being drilled profitably, the government can accept the highest bid placed on the tract so long as that bid meets the government minimum. If the tract is deemed potentially profitable, the government conducts a more thorough assessment of the tract and estimates its value. The government accepts the highest bid placed on the tract so long as that bid meets the minimum and is higher than at least one government estimate of its worth. If the bid fails those tests, it can be accepted on the basis of other criteria. Winning bidders are awarded leases to the tracts, which give them exclusive rights for a period of time. Leaseholders pay rent. If leaseholders decide to drill and extract oil and gas, they pay the government royalties on what they extract. On its face, the proposed liquidation sale raised some basic questions. Why dump the entire inventory at a time of relatively low energy prices? For a president who titled his first autobiography The Art of the Deal, what kind of deal-making was that? Would it amount to a giveaway? And how much inventory could energy companies buy at any one time? As it turns out, the announcement was misleading. The problems ran deeper. 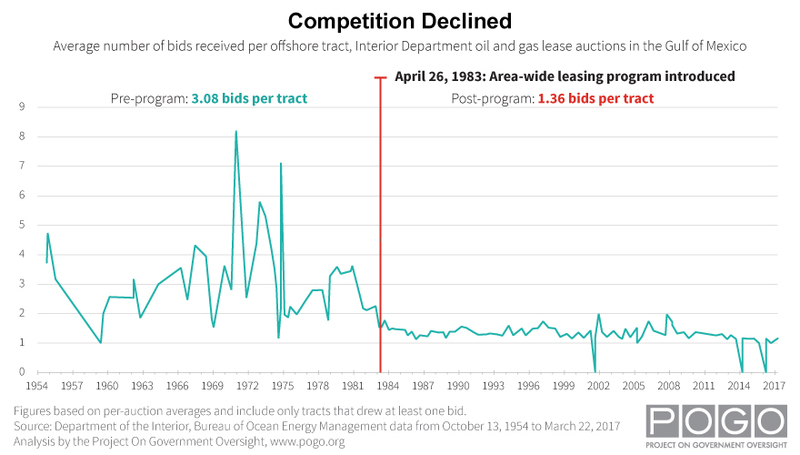 Since 1983, the government has been holding auctions in which all unleased tracts in vast areas of the outer continental shelf—rather than just a select subset —have been up for bid. The approach is known as “area-wide leasing.” Planning for the August 16 auction began during the Obama Administration. The results were typical. Companies bid on less than 1 percent of the 76 million acres up for sale. Among the small number of tracts that drew any bid, only 10 percent drew more than one bid, and none drew more than two bids. For tracts on which anyone bid, the average number of bids was 1.1. As the government tells it, the auction showcased the Trump Administration’s good work: making the Interior Department “a better business partner” and ensuring that taxpayers receive “a fair return” on federal resources. “Let’s make some money for the American people,” Katherine MacGregor, a Trump appointee at the Interior Department, declared as she opened the auction. But the dearth of competition echoed monotonously as MacGregor opened and read aloud bidding results, identifying swatches of the sea floor by their names and numbers. With almost no head-to-head bidding, more than 80 percent of the bidders came out as the high bidder for every offshore lease on which they bid. One bidder went 10 for 10. The companies bidding in the auction included Chevron, Exxon Mobil, BP, and Shell. The winning bids averaged $235.12 per acre, which on an inflation-adjusted basis was only 2.6 percent of the average under the prior leasing system. The lack of competitive bidding in the August auction could be ascribed in part to depressed fossil fuel prices. It could also reflect diminishing returns in the Gulf of Mexico, where shallow-water drilling has been going on since the 1930s. However, it fits a pattern since so-called “area-wide leasing” was introduced in 1983. For decades, even when oil prices were higher, sales of Gulf of Mexico leases have been defined by a near absence of actual competition. POGO’s analysis of auction competitiveness focused on the Gulf of Mexico because, in recent decades, that has been by far the main arena for U.S offshore oil and gas production and lease sales. In almost every sale since the Reagan Administration redesigned the auction system, just a small percentage of the Gulf tracts put up for auction have been bid upon. On average, over the nearly 30 years preceding the change, 62 percent of tracts offered were bid upon in each auction. For the 34 years since the change, that average has fallen to 8 percent. For the era before the change, the number of bids per tract leased in each auction averaged 3.08. For the era since then, it has plummeted to 1.36, POGO’s analysis of federal data found. Meanwhile, the average price per acre leased in each auction—as measured in 2016 dollars—plunged by 95.7 percent. To assess whether the government has made up through the amount of leasing what it has lost on prices, POGO compared the period of roughly 29 years before area-wide leasing was introduced to the period of roughly 34 years since. (The relevant data available online go back to 1954.) Overall, the number of acres leased rose from about 17 million in the earlier era to about 128 million in the more recent era. 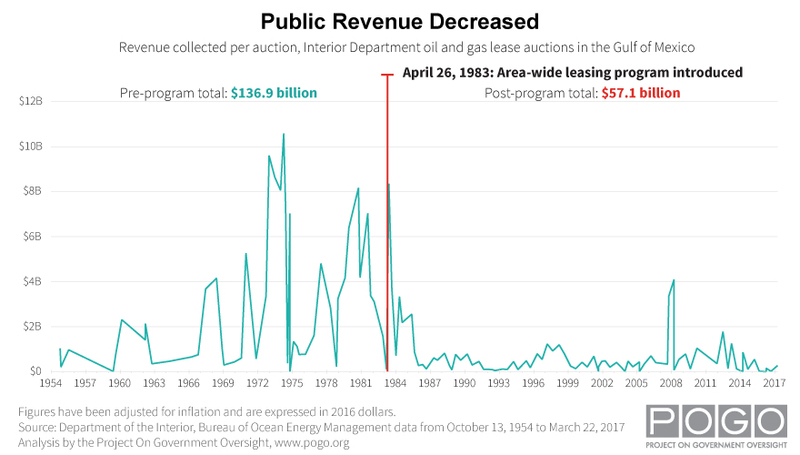 On an inflation-adjusted basis, the government’s revenue from auction payments declined from about $137 billion over a period of less than 30 years to about $57 billion over a period of more than 30 years. The system has amounted to “a clumsy and wasteful form of corporate welfare,” Juan Carlos Boue, an industry consultant and researcher at the Oxford Institute for Energy Studies, said in an email to POGO. The government’s approach has “transferred billions of taxpayers’ dollars into the coffers of major oil companies,” he added. Boue was reiterating the assessment he expressed in a 2006 book on offshore economics. Instead of vying for the same tracts, potential rivals have generally pursued different targets. Some potential rivals have teamed up to submit joint bids. POGO has no evidence that bidders have colluded to steer clear of each other. However, in research presented at a January 2018 economics conference, a team of professors used statistical tools to study the issue. “The bidding patterns are consistent with collusion,” co-author Robert H. Porter, a Northwestern University economist, summarized in an email to POGO. The bidding patterns do not necessarily reflect illegal activity or explicit communication among potential bidders, Porter added. If tracts in particular areas or having particular characteristics “are commonly understood to be associated with particular firms,” companies don’t have to communicate to stay out of each other’s way, he explained. A former Congressional investigator also expressed concern. “I think when you get single bids all over the place, that would raise a red flag . . . . It caused me concern,” said Reece Rushing, who examined offshore leasing when he was director of oversight and investigations on the Democratic staff of the House Natural Resources Committee. “You would want a system where you have competing bids to the maximum extent possible, and that’s clearly not the system that we have,” Rushing said. The current auction system has its roots in a push to transfer public assets into private hands. “I want to open as much land as I can,” James Watt, who at the time was Reagan’s Interior Secretary, told The New York Times in 1982. “We are trying to bring our abundant acres into the market so that the market will decide their value,” Watt said. Major oil companies were lobbying for something along those lines. They wanted to reduce competition, bring down the cost of acquiring leases, and offset the soaring costs of deepwater development, oil historian Tyler Priest has written. At Watt’s Interior Department, representatives from Shell laid out a proposal for “broad-area leasing,” Priest recounted in his book, The Offshore Imperative: Shell Oil's Search for Petroleum in Postwar America. Watt delivered, and Shell in particular “could take some credit for helping bring about this major policy change,” Priest wrote. Before the 1983 shift, companies nominated and the government chose offshore tracts for inclusion in auctions. That limited the number of tracts for sale at any one time, and it focused prospective bidders on tracts that at least someone had identified as potentially valuable. It forced companies to tip their hands about the tracts that interested them. Area-wide leasing swept that aside. Under the new system, everything in, for example, the Western Gulf of Mexico or the Central Gulf would be up for grabs at one time. The last five-year leasing plan, drafted by the Obama Administration in 2016, called for even bigger auctions featuring every tract in the Gulf of Mexico not subject to a ban on drilling. The August 2017 sale followed that plan. The states of Texas and Louisiana sued the Reagan Administration over area-wide leasing, which they argued decreased competition for leases and thus would reduce revenue flowing into public coffers. Marshall Rose, who served as BOEM’s chief economist from 1983 through 2016, told POGO that, today, the number of bids per tract is “barely more than one.” That is the nature of area-wide leasing, Rose said. But Rose said he doesn’t think the picture “is quite as bad as it looks.” As a measure of competition, the number of bids per tract doesn’t reflect the number of companies that looked at the tracts and considered bidding on them, he said. POGO asked Rose why it has been commonplace for BOEM to accept bids on the grounds that it considers tracts non-viable. The government declares tracts non-viable—meaning “worthless”—when evidence suggests that they contain no hydrocarbons or too little to make drilling worthwhile, Rose said. But determining what tracts are worth isn’t always easy, he said. Under area-wide leasing, “there are so many tracts out there that the Bureau in some cases just has very little data on which to base its evaluations,” he said. When its information is thin, the Bureau “is inclined to be cautious” about declaring a tract viable, Rose said. If it declares a tract viable, it must come up with an estimate of its value. If the estimate causes a bid to be rejected, the bidder could appeal, forcing the Bureau to justify its valuation, he explained. “Where it leads is that the Bureau tends to be careful about coming up with values that might be questioned,” Rose said. In deciding how aggressively to set valuations, Rose said, the Bureau balances goals: assuring that it gets fair market value and issuing leases. “And it doesn’t want to have an excessive amount of bid rejections after it goes through the trouble of holding a sale,” he said. In the federal auctions, bidders submit sealed bids, and there is no opportunity for them to drive up prices through back-and-forth bidding. Companies deciding how much to bid can factor in this knowledge: in most instances, if more than three decades of history is any guide, no one will bid against them. The scarcity of head-to-head bidding might be less of a problem if the government had other robust means of making sure that energy companies pay a fair price for drilling rights. The system has amounted to “a clumsy and wasteful form of corporate welfare,” according to an industry consultant and researcher. The Interior Department sets a floor on the bidding. Currently, the minimum bid the government will consider accepting for tracts in water at least 400 meters deep is $100 per acre. That’s up from minimums of $25 to $37.50 per acre from early 1987 to early 2010. But it’s still down by a third from $150 per acre in the early years of area-wide leasing, and that comparison doesn’t take into account the effect of inflation. In 2016 dollars, the minimum from years ago would amount to more than $360 per acre. Before declaring winners in the auctions, the Bureau reviews the high bids in an effort to make sure they are adequate. For tracts it deems non-viable, the minimum bid is all it takes to win a lease. The Bureau rejects hardly any bids as too low. In the most recent auction, 7.8 percent of the high bids—7 of 90—were rejected. That was more than usual. Since 1984, the Bureau’s reviews “have resulted in an average rejection rate of bids of approximately 3.7 percent,” BOEM has disclosed. The rejection rate is generally “way too low,” Rose said. To deter companies from submitting lowball bids, the rejection rate should be “much higher,” he said. For the same reason, he said, the government should raise the minimum bid. The government evaluates companies’ bids based in part on seismic research and other data obtained from the oil and gas industry. Individual bidders are required to submit data they used as part of their decision to bid. However, without a competitive market, it may be hard for anyone to know the market value of a lease or whether a particular bid meets it. One of the measures the government uses to determine fair market value, known by the technical term “Mean Range of Values” or “MROV,” is defined in a 2016 document as the “maximum” amount that a bidder could offer and still expect a normal rate of return on its investment. Yet many of the bids have exceeded that estimated maximum by wide margins. POGO found that 93.3 percent of more than 10,000 high bids over the past 20 years exceeded what was listed as the MROV for those tracts. On average, they exceeded the MROV by 392.9 percent. Meanwhile, 95.2 percent of them exceeded another valuation measure, the ADV mentioned above. On average, they exceeded what was listed as the ADV by 399.0 percent. Nonetheless, most of the posted estimates look like they were made with a cookie cutter. For example, over the past six years, 56.9 percent of the posted government estimates were identical: $576,000. That equated to $100 per acre, which for those years was the floor the government had set on bids for tracts in deeper water. What’s behind the cookie-cutter numbers? Based on explanations of the process published in the Federal Register and on the BOEM website, it appears that the government does not generate specific valuations for some or all tracts it considers non-viable. Rose, the former chief economist, said that when he was at the Bureau it did not develop valuations for tracts it considered non-viable. For other tracts, BOEM has been less than transparent. Where BOEM’s estimate was lower than the minimum bid, BOEM hasn’t disclosed its estimate, Rose said. Instead, it has listed the minimum as its estimate. “[T]here’s a hidden value that you don’t see,” Rose said. Digging deeper into the arcane process of bid evaluation, POGO noticed another oddity. To understand it, one must slog through potentially eye-glazing technicalities. Bear with us. In simplest terms, if bids don’t clear the bar, the government can lower the bar. To estimate the value of offshore tracts deemed "viable" and decide whether to accept bids for those, the government uses three key measures with names almost guaranteed to make you stop reading. Here’s a cheat sheet. Mean Range of Values (MROV) is defined as the maximum amount a bidder could pay and still expect a normal rate of return on its investment. Delayed Mean Range of Values (DMROV) is the (potentially reduced) value the government could receive if it rejected the bid in hand and offered the tract again in the next auction. Whichever of those is less—the MROV or the DMROV—becomes known as the Adjusted Delayed Value (ADV), and the ADV determines whether the bid is acceptable. Under procedures BOEM has published, even bids that fall short of the Bureau’s MROV estimates can be accepted if they meet an alternative estimate. The delayed measure is BOEM’s effort to account for the potential cost of rejecting a bid and waiting to offer the tract again in the next available auction. It is BOEM’s estimate of what the tract would be worth then, taking into account payments foregone or delayed and any draining of energy deposits that might occur in the meantime—say, as a result of other wells tapping the same oil reservoir. The government’s use of that alternative measure can result in head-scratching outcomes. When the Bureau considered bids placed in the August 2017 auction, it determined that the MROV for one tract was $17 million and that the delayed value of the tract was $6.9 million. In other words, BOEM estimated that, over several months, an unusually valuable tract would lose more than half its value. On that basis, BOEM accepted a bid of $12.1 million, much less than it said the drilling rights were worth at that time. The government has cited those gains as evidence that the system is working. When POGO analyzed the government’s treatment of thousands of bids spanning decades, it found that the government accepted a large majority of the bids on the grounds that the tracts were non-viable. Searching for an explanation, POGO discovered that someone else had noticed the same trend: Ted D. Tupper, a statistician and data miner who played an inside role in the process. Tupper retired in 2007 after more than 20 years at the Minerals Management Service, which was a predecessor to BOEM. During his time at MMS, he managed software the government used to evaluate bids, he told POGO. In 2014, when BOEM issued a highly technical notification that it was planning to tweak its bid review procedures, three parties filed comments. One was an oil company. Another was an oil industry lobby. The third was Tupper. “On the topic of improving the FMV [Fair Market Value] process, the principle [sic] problem is the viability/non-viable decision,” Tupper wrote. The majority of producing tracts had been classified as non-viable at the time they were leased, Tupper added, citing research he had done in 2012. The Bureau’s resource evaluation unit “needs to understand why so many non-viable tracts become productive,” he wrote. When it comes to the software and hardware used to interpret geologic data, the private sector’s deeper pockets give it an edge over the government, and there are cases in which companies have an information advantage, Tupper told POGO in an interview. If companies have a better understanding of the data than the government does, “they may be able to get something for real cheap,” he said. Tupper also said he identified four cases “where the oil companies got away with a big steal,” making major oil discoveries on tracts originally classified as non-viable. Tupper told POGO that studying policy issues like these is his hobby in retirement, and he has a recommendation for the government: It should reject bids for tracts it considers non-viable. Then, if companies want to lease them anyway, they should be required to explain to the government why they believe the tract is worth something. “It would make us smarter,” Tupper said. Asked about the government’s procedures for evaluating bids, Tupper said, “The system is designed to try to get things accepted.” That has been the philosophy since Jim Watt’s day, he added. Nonetheless, Tupper said it’s relatively rare for the government to make a big mistake, and he said energy companies have generally been overpaying. “In general, we’re getting market value and much better than market value,” Tupper said. One of the Interior Department’s primary aims is to promote energy production, but on that count, too, the leasing system gives reason for concern. It allows companies to gain control of drilling rights for years and then sit on them instead of drilling. The system makes it relatively inexpensive for companies to speculate in offshore leases—to snap them up and then hold them in case, say, a nearby discovery or an increase in oil prices gives them a compelling reason to drill. One could argue that, from the government’s standpoint, getting anything for the leases is better than getting nothing. One could also argue that putting the tracts in companies’ hands moves them a step a closer to producing oil or gas. On the other hand, if a tract proves more valuable than the auction payment reflects, it’s the company that is shrewd or lucky enough to have leased it that reaps the gain rather than the U.S. taxpayer. In that scenario, the company isn’t just making a profit; it’s receiving a windfall at the public’s expense. Also, the public might be served better if the drilling rights were in the hands of someone who would actually use them—instead of tying them up and preventing others from using them. POGO’s analysis of the most recent auction showed how leasing can play out. All but two of the 90 tracts that drew bids in the August auction had previously been under lease, and many of them had been leased multiple times, POGO found. More than three quarters of the tracts that had been leased before had no history of ever having been drilled, according to searches of a government database that goes back to 1947. For most of the tracts that had been leased before, no one had even taken an initial step toward drilling: submitting exploration plans for review. At least as reflected in a federal database that goes back to 1972. Instead, while they were under lease, the tracts were left dormant. By encouraging energy companies to lock in drilling rights when oil prices are relatively low, the Trump Administration could be passing up the chance to sell the rights for more money later. Though still lower than they have been for much of the past decade, oil prices are already up substantially since the last auction. Rose, the former chief economist at BOEM, said that, inside the Bureau, he argued against rushing to lease as much as possible as soon as possible. He said the optimal time is not always the present, and some deposits should be held for future generations. “I always maintained that we don’t need to lease everything now,” he said. Political people at the Bureau saw it differently, he added. They seemed to equate success with leasing as much as they could. Leasing portions of the Outer Continental Shelf incrementally instead of all at once would enable the government to gather information about potential energy deposits as drilling unfolds, Rose told POGO. That would help the government to make better assessments of what tracts are worth, he said. As it is, with so many tracts potentially in play in each auction, the government is left to make rushed evaluations once the bids are in, Rose said. POGO sought input for this report from the Interior Department and industry representatives but met almost complete silence. FOIA—the Freedom of Information Act—governs the release of records. According to a federal primer on the law, “The FOIA does not require agencies to … answer questions.” In addition, agencies routinely deny FOIA requests on the grounds that the requestors are asking questions instead of requesting records that they have adequately described. Could the system be improved? If so, how? If not, why not? Why has there been so little head-to-head bidding for offshore leases? How does BOEM respond to criticism that the system amounts to a giveaway of public resources to energy companies? The Bureau did not respond to a set of follow-up questions sent in January. The American Petroleum Institute (API), a trade association for the oil and gas industry, did not respond to interview requests. Several energy companies acknowledged but did not follow up on inquiries from POGO. In an August 2017 letter to the government, API, NOIA and other industry groups weighed in on how the next five-year plan for offshore leasing should be drafted. “The Associations do not see a need to move away from the current lease-sale construct,” they said. “The Associations fully support continued use of the current area-wide leasing program in all OCS [Outer Continental Shelf] areas,” they added. Requiring that tracts be nominated for auction would raise federal income by $150 million over 10 years, the Congressional Budget Office (CBO) estimated in 2016. In the world of federal budgets, that may seem like small potatoes. However, it is much more than the federal agency that oversees offshore drilling, the Bureau of Safety and Environmental Enforcement (BSEE), spends on environmental enforcement. In the 2017 fiscal year, BSEE’s budget for that amounted to $8.3 million. More fundamentally, the $150 million estimate was influenced by the relatively low price of energy when the CBO report was written, said former CBO economist Andrew Stocking, co-author of the report. As energy prices rise, so do the stakes, he said. The thinking behind CBO’s estimate remains largely opaque, and POGO is unable to explain how it squares with the tens of billions of dollars by which auction payments have declined since area-wide leasing was introduced. In October 2017, while POGO was working on this report, the ranking Democrat on the House Committee on Natural Resources, Representative Raul M. Grijalva (D-AZ), asked the Government Accountability Office to study the advantages and disadvantages of returning to the old leasing system. Some contend that the government faces potential tradeoffs—that allowing bidders to pay less up-front for drilling rights could lead to increased production and higher revenues of a different kind over the long run, and vice versa. 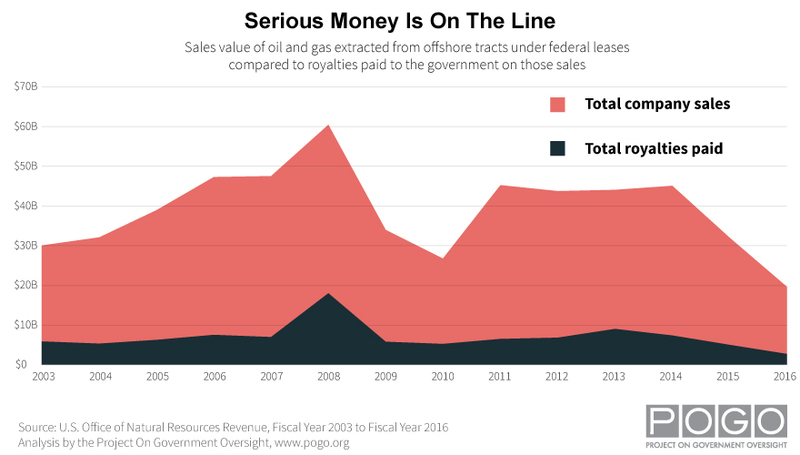 By way of context, the sums the winning bidders pay at auction (known as “bonuses”) are not the government’s only revenue stream from offshore drilling rights. While the tracts are under lease, the government collects relatively modest annual rents. Once the tracts start producing oil or gas, the government collects a percentage of the sales in the form of royalties. Further, the government’s goals go beyond generating a financial return for taxpayers. Other objectives, which may be at odds with each other, include protecting the environment and boosting energy production. The last five-year leasing plan developed by the Obama Administration discusses the same research. 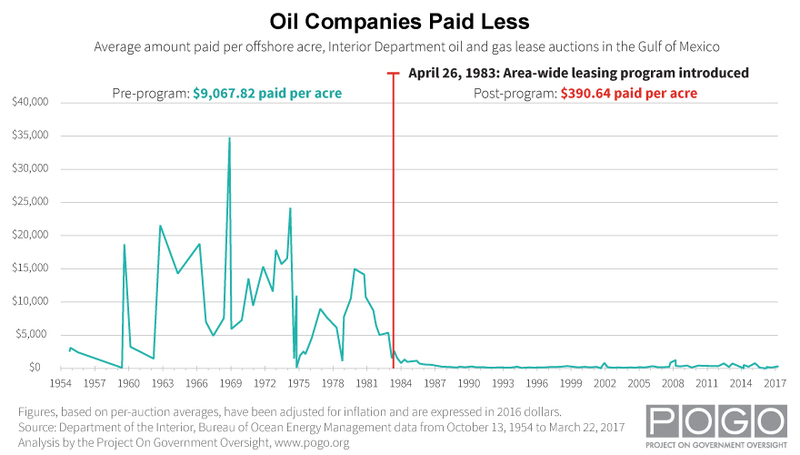 As the plan boils it down, the research suggests that, if the government went back to the old auction system, higher up-front payments “would be largely offset by” fewer tracts leased, less drilling, slower discovery of energy deposits, less future production of oil and gas, and lower revenues from rent and royalty payments. But the planning document also undercuts that reasoning. It shows why any connection between up-front auction payments and long-term production or royalty levels may be highly attenuated. “Activities such as the eventual exploration or production in these regions will be based on other factors (e.g., prices, rig availability, company operating budget) rather than on the number of lease sales,” the plan says. Whether companies invest in costly offshore drilling is influenced by factors as varied as the price of oil and gas, economic growth rates, world events, and technological advances, the plan notes. Royalty payments, in turn, are a function of prices and production volumes. From the time a tract is leased to the time production of oil or gas begins, a decade or more can pass, the plan says. The 2016 CBO report showed how far removed royalty payments can be from auction payments—time in which the industry, the market, and the world can change dramatically. In 2013, about 8 percent of offshore royalty income came from parcels that were leased in the previous 10 years, and the majority of the income came from parcels that were leased more than 20 years earlier, CBO reported. Even over shorter periods, forecasts of oil prices can be wildly off the mark. For example, in a set of economic projections from August 2014, CBO estimated that, in the fourth of quarter of 2017, by one measure (Refiner’s Acquisition Cost of Crude Oil, Imported), the price of oil would be $93.40 per barrel. As of November 2017, mid-way through the fourth quarter, it was actually $56.21, a difference of almost 40 percent. Since area-wide leasing was introduced, production of oil in the Gulf of Mexico—including any production from tracts leased earlier—has increased, according to data from the U.S. Energy Information Administration. The Interior Department has a history of letting energy companies have their cake and eat it, too—by issuing drilling rights at liquidation-sale prices and then cutting companies a break on the royalties they must pay on oil and gas extracted from federal property. Boue, the researcher at the Oxford Institute for Energy Studies, sees no causal connection. In the once inaccessible deep waters of the Gulf, technological progress would likely have led to increased production with or without area-wide leasing, he said. Meanwhile, federal data that go back only as far as the 1990s show that natural gas production in the Gulf has declined. The government seems to have recognized at times that it had a problem with companies sitting on drilling rights. Over the years, it has tried to give companies stronger incentives to use those rights. For example, it has raised minimum bids, adopted annual rental rates that escalate over time, and shortened the length of time that companies can hold certain leases without drilling. The government also has called for exceptions to area-wide leasing in areas off Alaska. Plans drawn up during the Obama Administration prescribed a more targeted approach to leasing there that would take into account considerations such as environmental protection. When all possible drilling sites in a vast area are up for grabs, it’s harder for the government to study any particular site, said Michael LeVine, an attorney with the group Ocean Conservancy. The Trump Administration has acknowledged that tradeoff. Lease sales limited to selected tracts “would tend to sell fewer leases and allow more focused environmental analyses,” the recently released first draft of the Trump Administration’s five-year plan says. The draft indicates that important decisions lie ahead. “BOEM will continue to analyze the use of area-wide leasing and focused leasing,” it says. The Bureau will consider fair market value, environmental factors, and the use of waters for subsistence hunting and fishing “when determining whether to hold area-wide or more focused lease sales in a particular area,” the draft says. From the beginning, critics worried that the Reagan Administration’s leasing program would amount to a fire sale, as the New York Times article from 1982 noted. Before long, the Government Accountability Office, then known as the General Accounting Office, was reinforcing those concerns. A 1985 GAO report on the first 10 area-wide sales found that the government received about $7 billion less than it would have under the former system. “GAO’s analyses indicated that the stepped-up pace of area-wide leasing, by itself, significantly decreased competition and government bid revenues for individual tracts,” the report said. The Interior Department hoped to make up the money over the long run, the GAO noted. Since then, other researchers have drawn conclusions similar to GAO’s based largely on some of the same types of Interior Department data that POGO analyzed. “Our results suggest that the mechanism for allocating leases worked reasonably well prior to 1983,” Kenneth Hendricks of the University of Wisconsin-Madison and Robert H. Porter of Northwestern University, who have studied offshore leasing in a series of academic papers going back to 1988, wrote in 2013. “Most of the auctions were competitive, auction revenues were high, and the government captured most of the economic rents through a combination of [auction] and royalty payments,” they wrote. Much of the leasing had been speculative, the professors found. They recommended switching to auctions with multiple rounds of ascending bids. They did, however, find a point potentially in favor of area-wide leasing. “The wide-spread availability of tracts generated a lot of speculative bidding and much lower drill rates, but it also increased the rate of exploration and development,” they wrote. “The number of tracts drilled in the twenty year period from 1983 to 2003 was approximately twice the number drilled in the almost thirty year period from 1954 to 1983,” they said. “Watt’s strategy worked in that it provided a mechanism to transfer publically owned resources to some of the wealthiest corporations in the world quickly, efficiently, and cheaply,” they wrote in a 2011 article published by the American Behavioral Scientist. In 2012, Markey, then the ranking Democrat on a House oversight committee, noted the lack of competitive bidding and asked the Interior Department about it. Was the government doing all it could to make sure the public received fair value for leases? And were there signs of collusion? BOEM responded, in essence, that the system was functioning well and that efforts to improve it were likely to backfire. Only a relatively small number of companies have the ability to operate in deep water, and the costs limit the number of deep water projects those companies will take on, the Bureau wrote. Auctioning fewer tracts to boost competition “may have the adverse effect” of reducing energy production over the long term, the Bureau added. What’s more, the Bureau argued, holding multiple rounds of bidding would probably reduce lease prices because merely edging out the runner-up would be enough to win. As for collusion, BOEM offered a more qualified answer. The Bureau’s analysis of lease sales in Alaska “has not been able to preclude the possibility that simple chance” explains “the small number” of dueling bids. In the Gulf of Mexico, in light of the number of tracts up for bid, “many non-overlapping bids are expected,” BOEM said. Yet, perhaps unintentionally, BOEM also showed why giving up auction revenues for hypothetically higher royalties way down the road could be a bad bet. Loose translation: What happens over the long run is anybody’s guess. To divine or demand market value, there may be no substitute for a truly competitive market. The government may be sacrificing a proverbial bird in the hand—higher auction revenues—for a bird in a distant bush, and the bush may be a shimmering mirage. In the meantime, the auction goes on. POGO's methodology in acquiring and analyzing Department of Interior data can be found here. 1. Reject bids on tracts the government considers worthless, or “non-viable,” as former Interior Department statistician Ted Tupper has proposed. Currently, when the government classifies tracts as non-viable, it lets companies lease them for its minimum price. Instead, the government should require bidders to explain why they see value where the government does not. That would help the government overcome a potential information disadvantage and insist on receiving fair value. 2. Investigate the Interior Department’s system for determining whether offshore tracts are viable. The Department has classified almost 80 percent of the Gulf of Mexico tracts on which companies bid as worthless. It has awarded the drilling rights on that basis. Many of the supposedly worthless tracts have gone on to produce oil and/or gas. Why does the Interior Department so rarely see value where energy companies see opportunity? Over the long run, how valuable have the non-viable tracts proven to be? Congressional committees, the Government Accountability Office, and the Interior Department Inspector General should investigate. 3. Investigate the Interior Department’s system for valuing those offshore tracts deemed viable. The government’s valuations are generally much lower than the values industry places on the tracts. Why? The Interior Department and independent authorities should examine the methods the Department uses to ensure that winning bids deliver fair market value. As part of that analysis, the government should take a close look at Interior’s willingness to accept bids that are lower than its own initial estimates; in some cases, Interior does so on the questionable theory that the tracts would fetch even less money if held and offered for sale at the next auction. 4. Don’t engage in fire sales. When energy prices are low, the government should preserve the option of auctioning offshore tracts later, when they might command higher prices. That way, the American people—as well as the companies that lease the tracts—could reap the gains. Holding fire sales is a bad idea for another reason: It makes it cheaper and more tempting for companies to snap up leases on a speculative basis and then tie up the tracts even if those companies are not motivated to drill or produce energy any time soon. 5. Hold targeted auctions instead of area-wide auctions. Auctioning fewer tracts at once would promote more head-to-head bidding, which could yield higher payments to the government and, by extension, the American people. If auctions were more competitive, the government could rely more on the market to value drilling rights, and it could rely less on its own limited ability to determine how much money tracts are worth. In addition, focusing auctions on a smaller number of tracts would enable the government to perform more focused economic and environmental analyses of the tracts actually in play. Also, if vast new areas were opened to drilling, as the Trump Administration has proposed, an incremental approach to leasing would allow the government to learn from drilling results and gather information over time about oil and gas deposits in those areas. Otherwise, the government risks parting with crown jewels before it has any inkling of their true value. 6. Charge companies a fee to nominate tracts for inclusion in auctions, as former Interior Department economist Marshall Rose has proposed. That would discourage companies from nominating tracts that don’t really interest them just to divert other bidders. 8. Raise the minimum bids. In the absence of head-to-head bidding, the minimum bids required by the government are often the only price hurdles bidders must clear to win drilling rights. The current minimums are too low to ensure that the public receives appropriate compensation for public assets. 9. Reject more bids. Combined with the low price hurdles and the general absence of competitive bidding, the low rejection rate encourages companies to underbid. 10. Strengthen incentives for energy companies to use their offshore leases instead of sitting on them. Only by drilling do companies produce oil and gas and generate royalty payments for the government. The current system makes it too easy for companies to tie up leases even if they lack the motivation or means to drill any time soon. To discourage speculation in offshore leases, the government should require companies to pay more money for the leases up front. Then, it should charge higher annual rents, and it should make sure the rents continue to escalate until drilling begins. 11. Investigate whether bidders are sharing enough information with the government. Bidders are required to disclose to the government information that goes into their bidding decisions. That’s supposed to help the government assess how much the tracts are worth and whether the bids deliver fair value. It’s supposed to protect the public from an information imbalance. Yet the government consistently places a lower value on tracts than bidders do, and it classifies many of the tracts on which companies bid as worthless. Is there something the bidders know that the government does not? Is there something the bidders aren’t telling the government? Finally, a word on priorities: Focus on the bird in hand, not just the bird in the bush. If there is a tradeoff between the revenue the government collects up-front through auction payments and the revenue the government has the potential to collect eventually through royalties on oil and gas production, the current system gives up too much on the front end. The long-term revenue is likely to be far off—if it materializes at all. The government should strike a healthier balance. Nicholas Pacifico is Associate General Counsel at the Project On Government Oversight.